It’s easy to fool our senses and perceptions. 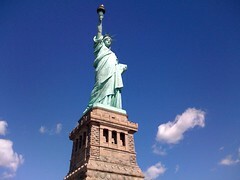 David Copperfield has done it for years; he made the Statue of Liberty disappear. Was that real? Actually, he had a setup of two towers on the stage which supported an arch to hold the huge curtain that would hide the statue. The cameras were only set up in one spot and focused on the monument through the arch. Once the curtains were closed, the stage slowly and almost imperceptibly turned just enough so when the curtains opened again, it looked like the Statue of Liberty was gone. Is perception much different when marketers and advertisers want us to believe in their products? I can’t help but notice the Maybelline mascara commercials promising lashes so lush and long that I can hardly wait to drive over to CVS and pick up the latest product. Is it realistic? There’s no possible way mascara can make eyelashes that long and perfect; my objectivity and verifiable actual experience will prove that at a later time, but the perception and a significant perceived improvement to me is what makes the experience real. Delivering superior customer service is also a perception. A customer’s perception of an issue is often different than the actual circumstance. Let’s take the example of waiting in a Verizon store for the next available agent. I walk in and there are three people before me, three representatives attending to customers and two other employees not engaged with customers. I am impatient because I have to leave in 30 minutes to pick my kids up from school and my impatience grows especially when I perceive the two other employees should be aware that I need some customer service yet they have made no overtures to help anyone. Excellent customer service, regardless of what the facts may be have to be especially sensitive to the customer’s viewpoint and perception of the issue. That’s where careful listening comes into play and suggesting solutions based on those very perceptions can make a profound impact. Insensitivity and indifference is a prelude to customer anger and the loss of the customer because they don’t really care who takes care of them since each representative is synonymous with the company. This is where standards of KPI or Key Performance Indicators come into play. Through training, monitoring, coaching, practice and new policies, employees understand that customers are driven by what they think about a business or service, and we want them to see positive perceptions. As for my experience at the Verizon store, I did approach one of the two representatives and asked them if someone could help me and explained my circumstances. The manager came over to me, listened to my problem with my cell phone and my time restraints; asked me if I wanted to leave the phone and come back after I picked up my children, and during that time my phone would be either repaired or replaced. I must admit he had the right attitude, and I was satisfied that someone had worked to help me. I ABSOLUTELY agree with this! If the client feels/perceives that you are providing value to the account, a trusting partnership will develop. With a trusted relationship, minor shortcomings could often be overlooked as grave issues. The issues will, of course, need to be addressed; but, the reaction (by the client) to the issue will not be as severe. Trust and honesty (completely open discussions from both sides of the partnership) is the key to a long lasting, valuable service engagement.